When I signed up for October: Unprocessed I knew the first thing I would be craving is sweets. Not a problem - I have lots of wonderful REAL foods to choose from when baking. Sugar is a no-no but honey is on the “approved” list. Butter, cream and chocolate are also options as ingredients. I am swapping white flour for whole wheat whenever possible and I made the switch in the recipe below. Googling "brownie" and "honey" bought me to a recipe for Honey Chocolate Brownies. Tweaking the recipe made for a drier, more cake-y brownie that became more dense after spending the night in the fridge. I added pecan butter from Sprouts as filling. Another even more decadent idea would be to drizzle it with Angela St. Cyr's 100 Mile Caramel Sauce. Mmmmmmmmmmmm! In a small bowl mix the cocoa powder, whole wheat flour and the flax seed. Set aside. Beat the butter with mixer until creamy. Slowly add honey and applesauce. Add the eggs, vanilla and salt. Mix in the dry ingredients and the nuts. Pour batter into greased 9x13x2 inch pan or Sur La Table's Baker's Edge Brownie Pan. Bake at 350 degrees for 30 to 35 minutes. Cool and cut into squares. Refrigerate overnight. 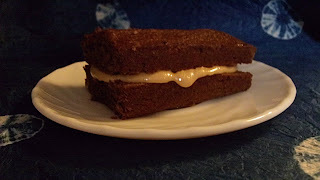 The next day, slice lengthwise, spread with any nut butter and make a brownie sandwich.